The Heritage Museum was established to conserve and display the memorabilia of the former RAF station and its satellite airfields. The Heritage Room was first opened in 2005 and is open to the public on a regular basis. 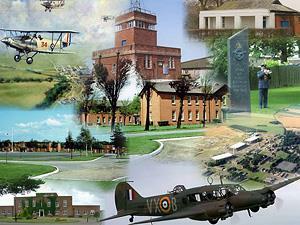 It has become a focus for the history of these former RAF stations, an important addition to students of aviation and local history, and as a venue for illustrated talks. APRIL - Easter Sunday 5th, Monday 6th April. MAY - Sunday 3rd May, Monday 4th May, Sunday 24th May, Monday 25th May. JUNE - Sunday 28th June. AUGUST - Sunday 30th, Monday 31st August. SEPTEMBER - Sunday 27th September.